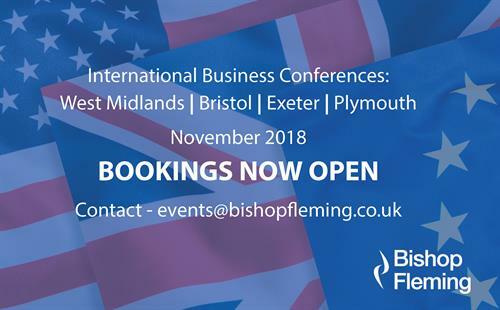 You are invited to join us for our International Business Conference taking place in Plymouth. With the lure of international opportunity, and Brexit only months away, now is the time to explore how expanding your horizons overseas could take your business forward. Whether you are looking to exploit overseas markets, or structuring to manage Brexit, you need the expertise and connections to make this happen. The conference will focus on helping your international ambitions and objectives become a reality. We will be joined by speakers from the USA, Ireland and The Netherlands who will be presenting on how to take advantage of these respective markets, whether for growth or to manage 'Breit'. The conference will include an update on the latest Brexit issues from our Brexit team, but just as importantly it will showcase and signpost international solutions. Please note that the event is free to attend but we anticipate the conference to be in high demand and would strongly advise booking early. Refreshments will be served at all of the events - please advise if you have any dietary requirements.